A benefit concert for children around the world. This unique show will bring together some of the leading performers from the world of the Islamic cultural entertainment including Outlandish, 786 and Kareem Salama. 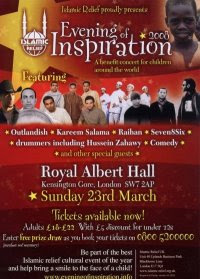 It provides an invaluable opportunity to raise funds and highlight Islamic Relief’s humanitarian work around the world. Adult tickets £18-£22, with a £5 discount for under 12's. that's awesome, I wish I could be there... I loove outlandish!